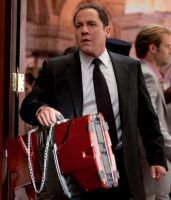 Jon Favreau opened up the Marvel Cinematic Universe with 2008’s Iron Man. He then offered us another trip with Old Shell Head in Iron Man 2, but for the third film in the franchise, Kiss Kiss Bang Bang director Shane Black steps behind the camera. Favreau spoke with Access Hollywood about how different it is to be on the set but not as the director. Iron Man 3 opens in 3D and 2D theaters on May 3, 2013. The action adventure stars Robert Downey Jr., Gwyneth Paltrow, Don Cheadle, Guy Pearce, Rebecca Hall, Stephanie Szostak, James Badge Dale, Jon Favreau and Ben Kingsley.